With the closing of the Ashton General Store Ashton United Church is offering a community gathering place for people to enjoy coffee, tea, and fellowship Tuesdays (except holidays) from 8:00 am to noon. A free will donation will be received to help offset cost of supplies. Please join us on the first Tuesday of the month when we serve bacon and eggs with half the proceeds from donations going toward support of the Carleton Place Hospital. Details are on the Pastoral Charge Activities and Events page. Note we are not having studies for the time being – Bible study for the time being is on a personal basis. When this Study resumes, we will let you know here and in the service bulletin. Announcements will be presented here. A reminder that while we do not have a permanent minister, you do not need to avoid attending our church services of worship. We have a supply minister who conducts our Sunday services. For many years we have changed our two worship services each Sunday to one service each Sunday during July and August. Typically every church, not just ours, sees a decline in attendance in the summer. People decide they’d like to take a Sunday or two off, they visit family, go on vacation for a period of time, or even take the opportunity to visit another church in a different area and worship with that congregation. During summer we hold one service on Sundays and it alternates between Ashton and Munster United Churches. In order to maximize your time to enjoy the warm weather, our July and August services start at 9:30 am. We will post the summer service times for 2018 in advance of those services, when the Official Board discusses and determines time and which church starts the first service. Most times of the year are when the needs of our local Food Bank are the greatest. Many Food Bank recipients are forced to spend more of their budget for supporting their children and/or utilities. We encourage you to keep your donations for the Food Bank coming because together we make a difference in our own backyard. As there are special occasions and holidays during the year, we can make an extra, special effort to donate a little extra to help make these holiday times very meaningful for those who depend on the Food Bank. The members of Ashton United Church are active with outreach and support to others in the community. We have a different project each months to try to cover many of those in need. These are the projects for this year. If you can help out with any one, we look forward to seeing you. 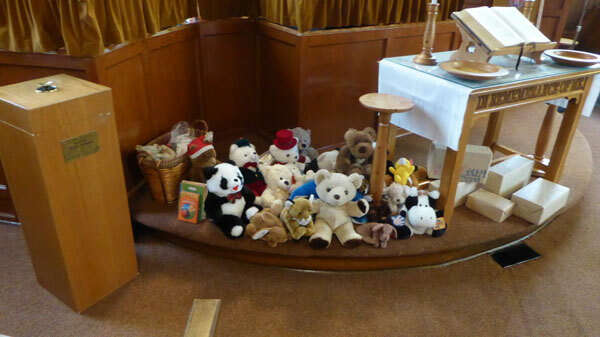 A great collection of stuffed animals donated by members of the congregation. They were donated to the police to be used to give to kids when involved in an accident. We have a mom and tot play group every Thursday morning from 9:30 to 11:00 am. Stop by with your little ones and join in all the fun. All are welcome including dads, grandparents, and caregivers. The Ashton UCW are collecting non perishable food items for the Lanark Food Bank. We are asking that you think about the less fortunate and bring in your donations. Let’s see if we can fill our basket more than once. Centre 507 need our help again, so the Ashton U.C.W. is collecting donations. Please help them out with their wish list by giving the following items. Clothing – new or gently used men’s pants, coats, shirts, hats, scarves, mitts, new long underwear, and socks. Food – peanut butter, soups, canned sandwich fillings, coffee, whitener, sugar, candies, etc. Personal Hygiene Supplies – deodorant, shampoo, tooth brushes, tooth paste, soap, disposable razors, shaving cream, etc. Financial Contributions – payable to Centre 507. Ashton Church undertakes several fund raising activities and events each year to augment income from offerings and to allow us to undertake programs beyond the basics. Some run on an ongoing basis and are operated by a small group of dedicated people. For example, we have been selling Grocery Store Gift Cards for years and the program provides a good return to the Local Fund of Ashton Church to support regular programs and special undertakings. Other activities, such as suppers, yard sales, and Music in the Village also contribute to support church operations. Simply stated, your church buys gift cards at a discount and sells them to supporters (you) who use the gift cards the same as you spend money. The church earns the difference. The cards are equivalent to cash at Loblaws in Ontario and Quebec, Real Canadian Superstore, Your Independent Grocer, and valu-mart stores. In addition, they can be used at Zehrs, No Frills, Fortinos, Extra Foods, Loblaws Superstore, Provigo, Maxi, Maxi & Co, Atlantic Superstore, and the Real Canadian Wholesale Clubs locally and across the country. The cards are a convenient way for you to shop because as you spend a portion of the card at a store, their system keeps track of your card balance and that balance is available for your next purchase. No need to carry cheques or cash and have to fumble with or keep track of change. The gift cards come in denominations of $10, $25, $50, $100, and $250. This allows you to purchase the exact amount you need weekly, every two weeks, monthly, or when is convenient. The cards are preactivated and a per Ontario law, carry no expiration date. Through your generous support, this program has been a resounding success and we thank you for your loyalty for making it so productive. For information contact Irma Willoughby or Wendy Barrie. You can purchase cards from Irma or Wendy. We also sell Sobeys gift cards which you can use for purchases at Sobeys and Freshco stores. The program operates in a similar manner to the Loblaws gift cards. Irma and Wendy are your contacts for these cards as well. If you are looking to purchase Fair Trade coffee, please contact Pat Lindsey at Munster United Church. You can call her or send a message to Munster United Church using the Contact Munster UC menu item under Contact Us. “Waymarks and Guideposts” is a fascinating history of the churches and congregations which came to form the Ashton-Munster Pastoral Charge. It was compiled by Dorothy Lewis and is available from Irma Willoughby of Ashton United Church. It contains mention of many local families and names.